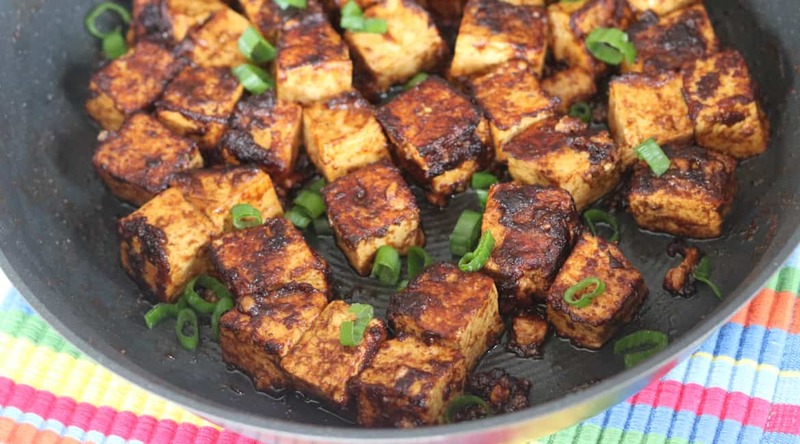 Crispy on the outside and silky on the inside, these scrumptious Vegan Peanut Butter Tofu cubes are coated with a garlicky, nutty and Sriracha glaze to create an unbelievably simple and flavour-packed recipe. Add to salads, stir-fries, curries or enjoy ‘as is.’ Meatless Mondays just got even better! 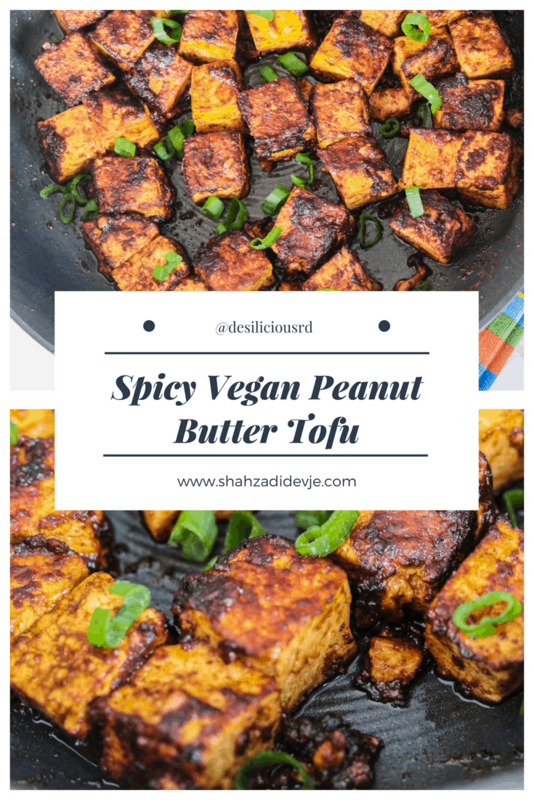 After my last tofu success with Masala Tofu Scramble, I was adamant to experiment again and fell in love with this vegan peanut butter tofu recipe. 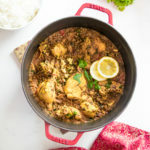 It’s spicy, finger-licking good and done in a flash – all essential criteria when hunting for a recipe, for a busy working mom. 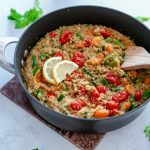 You probably already know that eating a more plant based diet is good for you, but how do you find delicious and simple recipes that the whole family will embrace? I must admit, a few years ago, I wan’t a big fan of tofu. 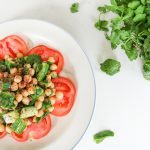 The truth is, I found tofu to be bland and mushy – felt like I was eating a sponge. 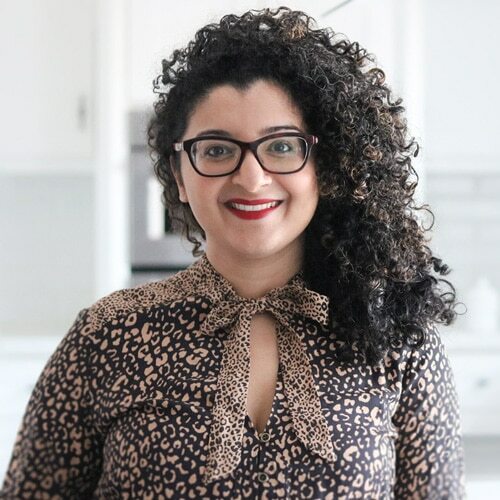 Since then, not only have I figured out how to prep and cook it, but I’ve also actually learnt how to make it taste amazing. 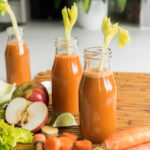 Before you do anything to it, squeeze out the excess fluid (I can’t say that enough). 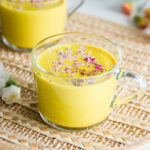 You want to empty the fluid to make room for all the lovely flavour to get absorbed. To do this, I place the block of tofu in a large tray, use paper towels to soak up the dripping fluid and then wrap it up in paper towels. Placing something heavy on top will drain out the fluid; use a heavy pot or a collection of plates and place them on top of the tofu for 15-20 minutes. Marinate it. I hear it all the time: tofu has no flavour! But I think that’s the best part; it’s a blank canvas and will take on any flavour you want. Strong, rich and bold marinades work really well – don’t be shy to experiment. Turn up the heat. 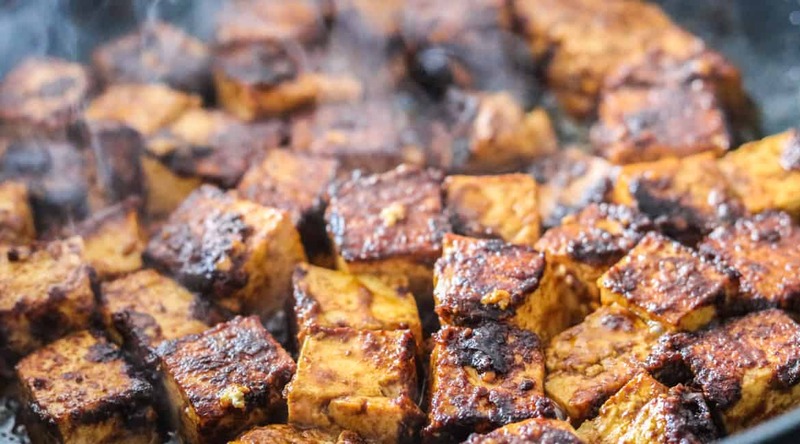 When sautéing tofu, you certainly want to turn up that heat. 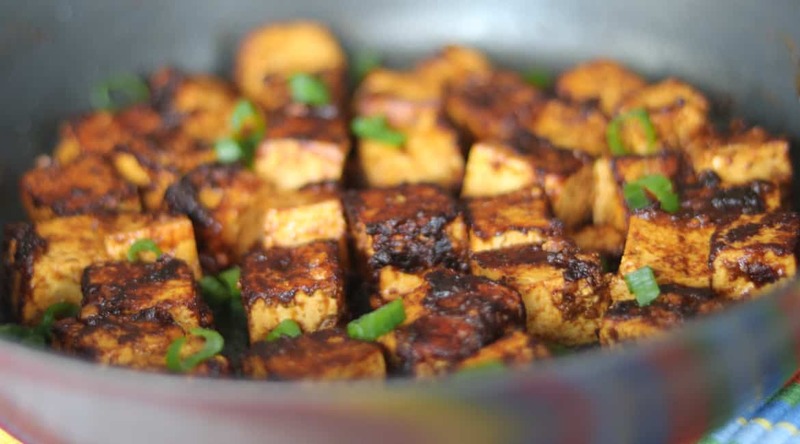 High heat, coupled with fat will give you that lovely crispy coating and prevent the tofu from sticking to the pan. Talking of pans, choose non-stick every time. You can’t ignore this. 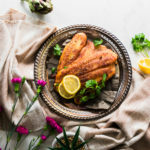 Despite your best efforts in prepping it, the pieces will fall apart by sticking to the pan – prepare for success with a good quality non-stick pan; it’s definitely worthwhile. You could coat it. This is a simple way to get even crispier tofu. I use either arrowroot flour or corn starch to dust the tofu pieces and sauté in a pan. Hubby loves nuts and anything with zing, so I knew these spicy vegan peanut butter tofu cubes would be a double hit. 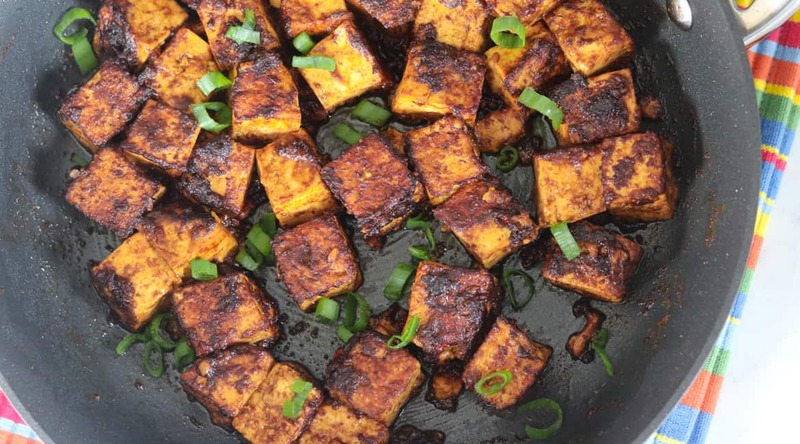 I added extra garlic and dark soy sauce, so the tofu could take on the bold flavours quickly – we were short on time and could not marinate for long. 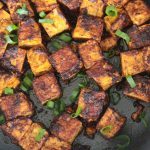 These Spicy Vegan Peanut Butter Tofu cubes make dinner preps incredibly fast and easy, but I also find they’re great as a make-ahead option. Sometimes, we prep them on Sundays and use for weekday lunches. 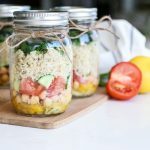 They taste fabulous thrown over salads (what a protein kick! ), with rice and vegetables and topped on veggie curries. Oh, and they taste AMAZING rolled up in a roti with chutney – you’ll be spoilt for choice! Being gluten free, these vegan peanut butter tofu cubes are ideal for those with any dietary restrictions. What are your favourite ways to enjoy tofu? 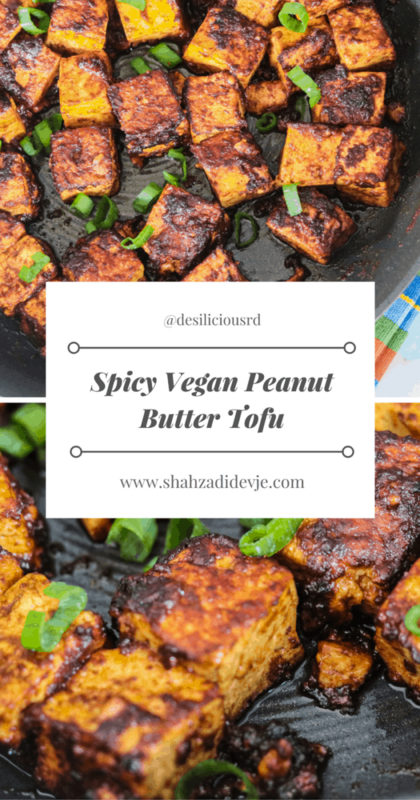 Have you tried this Vegan Peanut Butter Tofu recipe? Share in the comments below your favourite marinade? I want to know about it! Crispy on the outside and silky on the inside, these scrumptious Vegan Peanut Butter Tofu cubes are coated with a garlicky, nutty and Sriracha glaze to create an unbelievably simple and flavour-packed recipe. Add to salads, stir-fries, curries or enjoy 'as is.' Meatless Mondays just got even better!